Standard medical linear accelerators (LINACs) used in radiotherapy are equipped with a flattening filter (FF). The FF is designed to produce uniform dose distribution across the field in a homogeneous medium. Recently, there has been an increasing interest in operating medical LINAC without FF. A FF free (FFF) LINAC is basically a standard LINAC with the FF removed from the beam line. The main advantages of removing the FF are increased dose rate in addition to reduced scatter and leakage radiation inside and outside the target volume.,,,, These benefits result from removal of attenuation of the primary beam, reduction of the scatter radiation originating from the FF, and reduction of leakage radiation due to decrease in beam energy. Reduction of the head scatter also improves dosimetry of the FFF beams due to reduction of output variation with field size and field size-dependent parameters.,, FFF LINAC has been investigated in detail and is used in radiotherapy treatments including advanced modalities such as intensity-modulated radiation therapy treatments and stereotactic radiosurgery.,,,, As expected, there are differences in the beam characteristics of LINAC operated in FFF mode to that of LINAC with the FF mode. FFF LINAC beam is softer, for example, the central axis percent depth dose in water for a 6 MV FFF beam resembles a 4 MV FF beam. In addition, the lateral dose profile is peaked on the central axis, and less integral target current is required to generate the same dose to the tumor., As a result, the shielding parameters, such as the tenth-value layers (TVLs) and scatter fractions, calculated for flattened beams, may not be appropriate for shielding evaluations for unflattened beams.,, Since FFF beam is used for advanced modalities requiring higher monitor units (MUs) to be delivered, it must be determined whether shielding needs to be enhanced or reduced to use an FFF machine in comparison to vault of FF machine. Considering the LINACs with FFF beam available in India and their growth, this study was carried out to find the impact of FFF beam on bunker design of LINAC facility in Indian scenario. The present study is to assess the structural shielding requirements of a 6 MV LINAC operated in both FF and FFF modes in comparison to a standard 6 MV LINAC. This study includes the detailed calculations of thicknesses required for the shielding of primary and secondary barriers of 6 MV LINAC bunker operated for FF and FFF photon beams. The calculations have been carried out by two methods, one using the approach given in National Council on Radiation Protection (NCRP) Report No. 151 and the other one is based on the MUs delivered in clinical practice. In recent times, several technical changes have been augmented in the treatment delivery modality which enables higher dose escalation to tumor and rapid dose fall off outside the tumor. The technologies involved for such delivery enhance the MUs generated from the LINAC due to the presence of different beam modifying techniques. This study also includes the radiation survey of the installations. 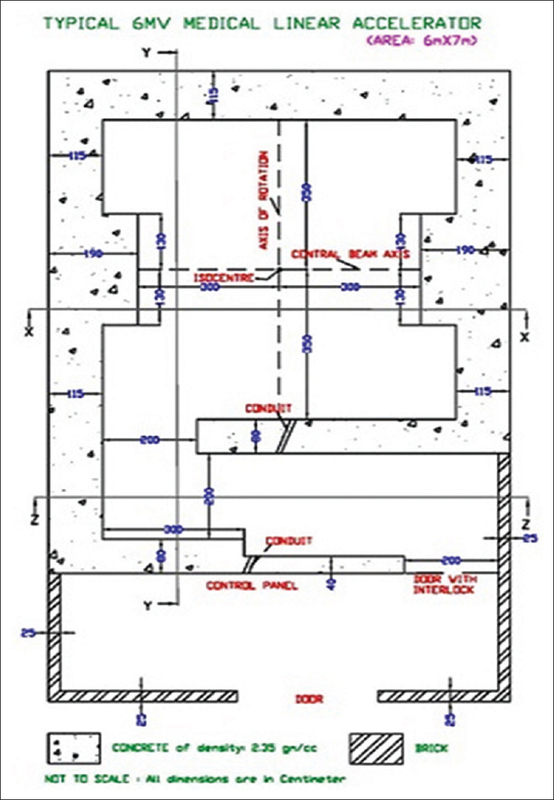 A standard layout of 6 MV accelerator bunker used in this study is presented in [Figure 1]. Radiation generated by LINAC can be divided into primary and secondary components, the latter can further be divided into scatter and leakage radiation. The calculations for basic shielding parameters includes workload (W), use factor (U), occupancy factor (T), distance from the radiation source (d), and permissible dose limit (P) as prescribed by the regulatory authority of the country. Figure 1: Standard layout of a 6 MV medical linear accelerator bunker. where DP is dose (in cGy) delivered per patient, NP is number of patients treated per day, Nd is number of days per week, and DD10 is central axis dose at 10 cm depth normalized to dose value where dose maximum occurs. U is the fraction of time that the beam is likely to be incident on the barrier and is considered as 0.25 for primary wall and 1 for secondary wall. T is defined as the kind of occupancy around the installation. In this study, T is considered as 1 for all the locations. The distance between source and point of interest, which has been considered with reference to the standard plan as provided in [Figure 1] and measured in centimeter for all purposes. In India, P is 20 µSv/week and 400 µSv/week for general public and radiation workers, respectively. where W, U, T, P, and d have their usual meaning. Then, the primary barrier thickness (tpri) can be determined using number of TVLs, n, based on energy of the treatment unit and the type of shielding material being used. It may be noted that wall thicknesses determined for primary barriers will be more than the thickness required to shield leakage and scattered radiation, which are comparatively insignificant, and hence, no further calculations are required. The values of TVL reported for corresponding energy of FF and FFF beams are different, and accordingly, they have been used in our calculation. These barriers are not in the direct line of the radiation beam but necessary to shield from leakage radiation from the treatment head and scatter from the patient and the treatment room walls. where, P, W, and T have their usual meaning. The scatter primary ratio (αs) depends on the energy of the photon and the scattering angle. Values of αs are available for 400 cm 2 irradiated field area for all clinical beams, F is the field area incident on the patient in cm 2, dsca is the distance (in meter) from the radiation source to the patient in meters, and ds is the distance from the patient to the point of interest in meters. Radiation scattered by a patient is usually <0.1% of the incident radiation per 1000 cm 2 (0.1 m 2) area irradiated. For large scatter angles, the energy of the scattered radiation will be degraded and the protection designed against leakage radiation should provide adequate protection against scattered radiation from the patient. where αw, s is the wall reflection coefficient, which depends on the wall material, scattering angle, and beam energy, A is the field area projected on the scattering surface (wall) in m 2, dw is the distance from the radiation source to the scattering surface (wall) in meter, and dr is the distance from the scattering surface (wall) to the point of interest, in meter. The photons scattered by the wall and by the patient are of about the same energy. If the thickness required to shield from patient scatter is different from that needed to shield from wall scatter by one tenth-value thickness (TVT) or more, the larger thickness is used, otherwise, one half-value thickness (HVT) is added to the larger thickness. Similarly, one HVT is added to higher thickness if the thickness required to protect from leakage differs from that required to protect from scatter by <1 TVT. The roof section that can be struck directly by the primary radiation is also a primary barrier and the formula used to determine the required thicknesses are the same as that for primary. Since for LINAC operating below 10 MV, there is no production of neutron, the scatter and transmission of primary, leakage, and scattered radiation need to be considered while estimating dose at maze entrance. where integrates through all gantry angles, DP is the dose arising from patient scatter, f is the primary radiation transmitted through the patient, Dw is the primary radiation scattered by the wall into the maze, DL is the leakage radiation scattered down the maze [Figure 2], and DT is the leakage radiation transmitted through the maze wall. 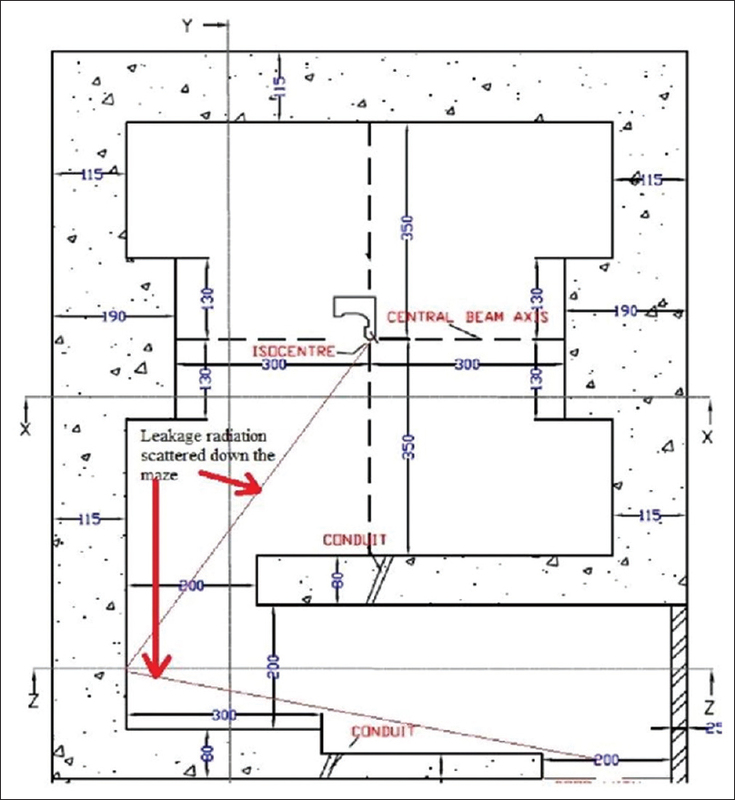 Figure 2: Layout of a 6 MV medical linear accelerator bunker indicating leakage radiation scattered down the maze. All the symbols have the same meaning except DW, T, which will be primary radiation transmitted through the maze wall and further scattered to the maze entrance. Around one thousand patients' data were taken from geographically different regions, considering the variation in patients' physique and from accelerators of different manufacturers (Varian Medical System, USA and Elekta Medical System, UK) capable of delivering FF and FFF beam. Patients' data were grouped for five different major clinical sites such as brain, head and neck, thoracic, abdomen, and pelvic region. Actual MUs delivered have been obtained from the planning systems for these different cases using the 6 MV photon beam in both FF and FFF modes. The data, hence, generated are presented in [Table 1]. The small field treatment cases are not included as variation in MU delivered in FF and FFF mode is not significant. Practical workload, W is arrived at by analyzing these data of MU delivered. The workload for FF mode is the cumulative MU delivered for 5 days, which is estimated from the daily average dose for stated clinical sites observed over a period of 6 months. Over this period, we have noted that 80% of the patients are treated in FF mode and only 20% of patients are treated in FFF mode. Therefore, in this study, the workload for a facility using both FF and FFF mode is assumed to be the combination of workloads for 80% of beam in FF mode and 20% of beam in FFF mode. Based on the W, barrier thicknesses are evaluated using the values of TVL reported for corresponding energy of FF and FFF beams. where, IDR is the instantaneous dose rate and is the dose rate of the photon beam. W and U have their usual meaning. FF beam is harder with higher average beam energy and percentage depth dose (PDD). For example, PDD at a depth of 10 cm for FF beam is 66.1% whereas for FFF beam, it is 63.4%. In conventional FF LINACs, the workload has been calculated considering seventy patients treated in a day and 5 days in a week. However, it is observed that number of patients treated in a LINAC capable of delivering FF and FFF beam is maximum 50 instead of 70. Using equation 1, W is found to be around 33% less for FFF beam than the W calculated for FF beam (i.e., W is about 1.04 × 105 for FF and 0.78 × 105 for FFF). Since in clinical practice around 80% of the patients are treated in FF mode and 20% in FFF mode, W is calculated using the weighted W for FF and FFF beams, that is, total workload, W = 0.8 × WFF + 0.2 × WFFF. Using DP = 200 cGy/patient, Nd = 5 for FF and FFF, and using NP = 40 and DD10 = 0.661 for FF and NP = 10 and DD10 = 0.634 for FFF, total workload, W is found to be 0.76 × 105 cGy/week at 1 m.
For primary barriers, the values of U and T are 0.25 and 1, respectively. Thickness for primary wall is calculated using equation 2 and published value of TVL for FF and FFF beam has been used for concrete of density 2.35 g/cm 3. Since the initial considerations are 100 cm from source to isocenter distance and a clearance of 300 cm from isocenter to the point of interest where the P value is desired, calculations have been carried out for multiple iterations till the thickness becomes constant. It is found that primary barrier thickness for a LINAC operated in FF mode is higher by 24% to that a LINAC operated in both FF and FFF modes with an assumption that only 20% of the workload is shared in FFF mode. Similarly, for secondary barrier thickness calculations, the total radiation level is contributing with respect to head leakage as well as scatter from patient. The thickness required was calculated using equation 3 and found that the secondary barrier thickness for a LINAC operated in FF mode only is higher by 26% to that a LINAC operated in both FF and FF mode with an assumption that only 20% of the workload is shared in FFF mode. Using equations 4-6, patient scatter, wall scatter, and maze scatter were calculated. It was found that secondary barrier thickness calculated for leakage radiation is adequate to shield the scattered radiation as well. Considering the length of the paper, the detailed calculations are avoided. The data of delivered MUs in FF and FFF mode for different clinical sites have been analyzed to arrive at a practical workload [Table 1], which is the major factor in shielding calculation. A total of thousand patients were considered, that is, twenty groups, each group with five major clinical sites and ten patients for each site. The major clinical sites chosen are brain, head and neck, thoracic, abdomen, and pelvic region. MUs delivered per patient for both FF and FFF modes are presented in [Table 1]. Hence, W is the total MUs delivered in 5 days (in 1 week period). It is found that W is about 1.95 × 105 cGy/week at 1 m for FF beam and 2.3 × 105 cGy/week at 1 m for FFF beam. The same modality of calculation is adopted for evaluating shielding adequacy of accelerator bunker, that is, the contribution of FF beam is 80% and to that of FFF beam is only 20%. For barrier calculations, workload W = 1.95 × 105 cGy/week in case of 6 MV beam in FF mode and 2.3 × 105 cGy/week in case of FFF mode has been considered. It is found that primary barrier thickness for a LINAC operated in FF mode only is higher by 20% to that of a LINAC operated in both FF and FFF modes. Similarly, secondary barrier thickness was calculated and found that the secondary barrier thickness for a LINAC operated in FF mode is higher only by 19% to that a LINAC operated in both FF and FFF modes. Earlier investigations by Kry et al., on the vault shielding of LINAC operated in FF and FFF mode estimated an overall reduction of 20% in the primary and secondary wall thickness of the LINAC bunker for FFF mode of operation in comparison to FF mode of operation. In our study also, it is observed that the reduction in primary and secondary wall thickness of the LINAC bunker for practical situations is 20% for primary and 21% for secondary, which is consistent with those reported in literature. Rw is estimated using equation 8 for both FF and FFF modes LINAC. In this calculation, W is the clinical workload, IDR is measured for both FF and FFF modes using the maximum dose rate available, and the suitable value for U is considered depending on the location. The radiation survey was carried out in all installations from where the clinical data were taken for this study. However, representative data of the radiation survey of only one installation have been presented in [Table 2]. As bunkers were constructed for FF mode of use, the measured radiation level is further scaled for FFF mode with a factor of , where tFFF and tFF are the thicknesses estimated for FFF and FF mode, respectively. It is found that the radiation level all around the installations are within the acceptable limit. The removal of FF significantly decreases local dose rates outside the treatment vault. In the present study, shielding requirements of a 6 MV medical LINAC operated both with and without the FF are assessed using the NCRP Report No. 151 and also by MUs delivered for clinical practice in Indian scenario. The results based on NCRP approach suggest that the primary and secondary barrier thicknesses are higher by 24% and 26%, respectively, for a LINAC operated in FF mode to that of a LINAC operated in both FF and FFF modes with an assumption that only 20% of the workload is shared in FFF mode. Primary and secondary barrier thicknesses calculated from the data on clinical practice also show the same trend and are higher by 20% and 19%, respectively, for a LINAC operated in FF mode to that of a LINAC operated in both FF and FFF modes. Hence, it is found that overall the barrier thickness for a LINAC operated in FF mode is higher about 20% to that of a LINAC operated in both FF and FFF. As a result, the wall thickness can be saved by about 20% for a LINAC operated in both FF and FFF modes in comparison to the LINAC operated in FF modes only. Hence, the lower consumption of shielding material and space for new treatment vaults housing the LINACs with FFF and FF modes may reduce the building cost, whereas for existing facilities, one might take the benefits in terms of increased weekly workload. We are of the view to use similar workload while estimating the weekly radiation level around the LINAC bunker. Further, this approach of calculations of shielding thickness for 6 MV bunker can also be extended for higher energies such as 10, 15, and 18 MV as well. We would like to thank Dr. A. U. Sonawane, Head, Radiological Safety Division, Atomic Energy Regulatory Board, Mumbai, India, for his encouragement and support throughout the study. Georg D, Kragl G, Wetterstedt Sa, McCavana P, McClean B, Knöös T. Photon beam quality variations of a flattening filter free linear accelerator. Med Phys 2010;37:49-53. Kragl G, af Wetterstedt S, Knäusl B, Lind M, McCavana P, Knöös T, et al. Dosimetric characteristics of 6 and 10 MV unflattened photon beams. Radiother Oncol 2009;93:141-6. Kragl G, Baier F, Lutz S, Albrich D, Dalaryd M, Kroupa B, et al. Flattening filter free beams in SBRT and IMRT: Dosimetric assessment of peripheral doses. J Med Phys 2011;21:91-101. Lang S, Reggiori G, Puxeu Vaquee J, Calle C, Hrbacek J, Klock S, et al. Pretreatment quality assurance of flattening filter free beams on 224 patients for intensity modulated plans: A multicentric study. Med Phys 2012;39:1351-6. Stathakis S, Esquivel C, Gutierrez A, Buckey CR, Papanikolaou N. Treatment planning and delivery of IMRT using 6 and 18 MV photon beams without flattening filter. Appl Radiat Isot 2009;67:1629-37. Kry SF, Howell RM, Polf J, Mohan R, Vassiliev ON. Treatment vault shielding for a flattening filter-free medical linear accelerator. Phys Med Biol 2009;54:1265-73. Jank J, Kragl G, Georg D. Impact of a flattening filter free linear accelerator on structural shielding design. Z Med Phys 2014;24:38-48. NCRP. Structural Shielding Design and Evaluation for Megavoltage X- and Gamma-Ray Radiotherapy Facilities. Report No. 151. Bethesda, Maryland, USA: National Council on Radiation Protection and Measurements (NCRP); 2005. IEC. Medical Electrical Equipment: Particular Requirements for the basic safety and essential performance of Electron Accelerators in the Range 1 MeV to 50 MeV (60601-2-1). 3rd ed. Geneva, Switzerland: International Electrotechnical Commission (IEC); 2009. IAEA. Radiation Protection in the Design of Radiotherapy Facilities. Safety Reports Series No. 47. Vienna, Austria: International Atomic Energy Agency (IAEA); 2006.